Months later, God called Dan to be the Youth Pastor of a church where we met a Christian attorney. “We’d like to talk with you about adoption,” Dan told the attorney. His response wasn’t encouraging. “I rarely do adoptions but come by my office and fill out the papers – just in case.” The following week, the attorney called. “This is the stork,” he said. I laughed. “I have a baby for you,” he continued. I stopped laughing. “A young woman came into my office today. She’s seven months pregnant and wants to give her baby up for adoption,” he explained. I knew! Every doubt disappeared. Every fear faded into the certainty that this was God’s plan for us. Six weeks later, our son, Jered Daniel Southerland, was born and three years later, his beautiful sister, Danna Marie, completed our family. Life was unbelievably sweet. We daily celebrated the fact that Jered and Danna were our chosen babies and wanted them to understand just how special they were. I knew the day would come when both children would have questions about their birth and adoption. I just thought I had a little more time. 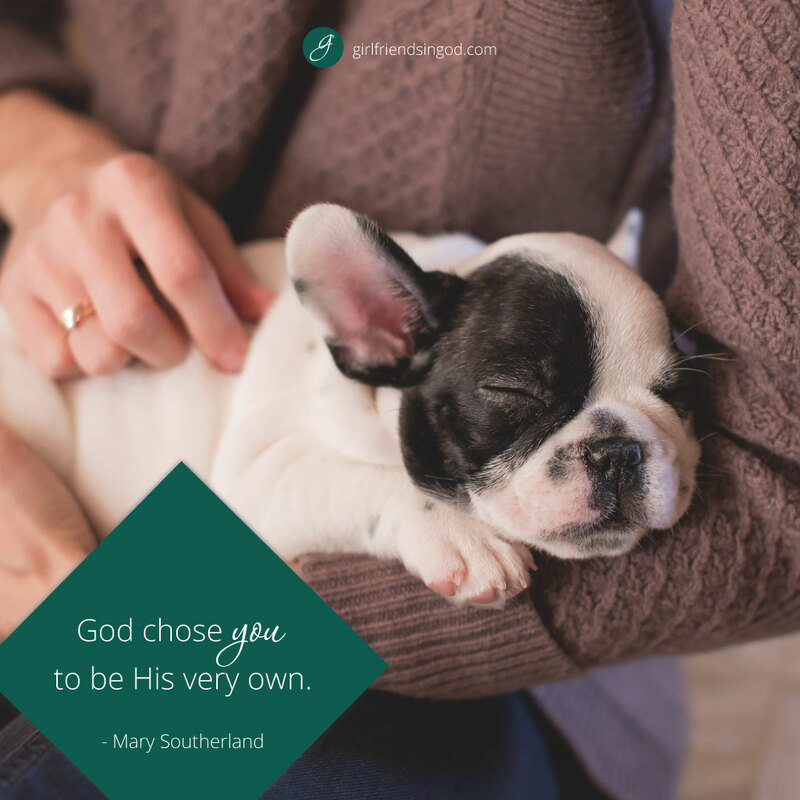 When Jered was four-years-old, we were given a chocolate Labrador puppy that quickly outgrew our small yard, our not-so-understanding neighbors and our apprehensive children. We named this gentle giant Bruno. But it soon became clear to all of us that we were not the right family for Bruno. After an intensive search, we discovered “Adopt a Pet,” a remarkable organization that finds homes for animals whose owners, for one reason or another, cannot keep them. We were promised that Bruno would be placed in a home where he would be loved and well cared for. We talked and explained, struggling our way to the difficult decision that it was time to put Bruno up for adoption. Still, when they came to pick up Bruno, we all cried. We knew it was the best plan for Bruno – for us – and for a very excited family that wanted and had the room for a Labrador. But it still hurt. Sometimes, doing the right thing – the best thing – the highest thing – is also the most painful thing. I paused for a moment, basking in the simple wisdom of my Father, spoken through the heart of my only son. “She did want you, honey. And she did love you … so much, in fact, that she was willing to give you away, just like we gave Bruno away. Just like we wanted what was best for Bruno, your birth mother wanted what she thought was best for you.” I fully recognize that it was an extremely simple illustration for a profoundly complex life circumstance – but it was enough. This is a touching story and great example of adoption. I got tears at you groping for just the right answer and God gave you the perfect words for a four year old to understand. I waited 10 long years before God blessed me with my first son! I had given up hope but still prayed every day for a baby if it was God’s will. I cried when I read this because it brought up so many memories of wanting children and thinking it was not going to be in the plans for my life. I ended up being blessed with two sons and both got married this year! What a wonderful blessing children are, and I am so thankful God chose me to be their Mother! It’s amazing that God gave up his only son so that we can be his children! Hard to comprehend sometimes but I am so very thankful that he did! Thank you for your wonderful devotion today! I know God has a plan for the rest of my life now that my boys are out of the house. I just needed to be reminded that he isn’t through with me yet! Thank you so much for sharing this story from the other side. What you shared with your son about Bruno is the absolute truth. I at 18 had to give my child up for adoption. All you want is for your child to have the absolute best. It is the single hardest decision I ever had to make. You wonder about your child all the time. She and I have been reunited after 20 plus years and I am so thankful she had a mother and a father with a wonderful family to grow up in. She is so incredibly blessed. She has the best parents. And to you, thank you for your willing heart to adopt. Desperately, desperately, DESPERATELY needed this tonight. I was sorting unread emails in my inbox and found this. Crying my eyes and heart out over the things in our lives that are happening and affecting my adopted daughter. I’m going to read those three sections of scripture because all three topics are on my mind and heart tonight.